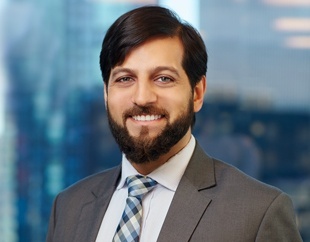 Anil Vassanji represents corporations and individuals in the financial services, real estate, and other industries in connection with a wide variety of complex commercial disputes. Representation of real estate investors in an ongoing dispute over a luxury high rise development in New York. Representation of Signature Bank in connection with employment litigation against First Republic Bank. Representation of a class of tenants before the N.Y. Court of Appeals concerning rent stabilization. Pro bono representation of an individual placed on the FBI's No Fly List. Prior to joining Friedman Kaplan, Mr. Vassanji was an associate at Sullivan & Cromwell LLP. During his time there, he represented a wide range of corporate and individual clients on an array of civil and criminal disputes, including securities, environmental, class action, intellectual property, antitrust, appeals, cybersecurity, and regulatory matters. Mr. Vassanji serves as the chair of the Associates’ Committee for the Center for Constitutional Rights, a human rights non-profit organization based in New York, which employs creative and innovative litigation, advocacy and strategic communications in its commitment to use the law as a positive force for social change.